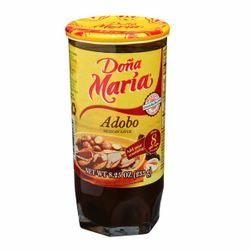 Dona Maria Adobo is a Mexican condiment similar to the mole sauce, its spicy and sweet, with roasted spices. A special combination of chile ancho, chile pasilla and peanuts that give the chile sauce its thickness. Like mole it also comes in a paste packaged in a jar. Adobo Do?a Maria goes well with fish and vegetables, as well as salad dressing combining it with fruit juice, or by itself for mild stews and as a condiment for ceviche by just adding 2 table spoons of lime juice. Cooking Instructions:Add 4 parts chicken broth, water, beef broth or vegetable broth to 1 part paste. Use low heat stirring constantly and bring to a boil (210 degrees). Keep the sauce in low heat for 4 minutes and serve warm over chicken or other foods. Ingredients: Soybean Oil, Chile Peppers, Crackers (wheat flour, soy vegetable fat, iodized salt and corn starch), Sesame Seeds, Peanuts, Sugar, Iodized Salt, and Natural Flavors. Dona Maria Adobo es un condimento Mexicano similar al mole, es picosito y dulce, con especias tostadas. Una combinacion especial de chile ancho, chile pasilla y cacahuates le dan al adobo su espesor. Como el mole en Adobo Dona Maria viene en pasta en un vaso. El Adobo Dona Maria se lleva muy bien con pescado y vegetales. Tambien se puede usar para hacer aderezo para ensaladas combinandolo con media taza de jugo de fruta. Puedes hacer un guisados con sabor suave o combinarlo con dos cucharadas de limon para hacer un complemento para ceviche. Direcciones de Uso:Agregue caldo de pollo, agua, caldo de vegetales o caldo de carne, a una parte de la pasta. Caliente a fuego lento constantemente hasta que hierva (210 grados) y se disuelva bien la salsa. Manteca al fuego lento por 4 minutos y sirvase caliente sobre pollo o otros platillos.